The Atlas of Living Australia (Atlas) has access to biodiversity information only because the information is available in digital form. 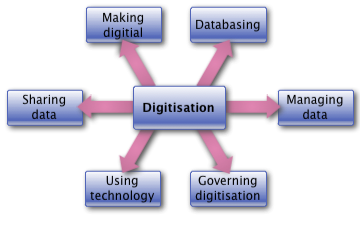 To assist data providers create and manage digital data, the Atlas has been cooperating with partners to produce a range of guidance on different aspects of digitisation. See also Imaging Hints and Tips for information on a range of imaging topics. Digitisation is essentially making a digital version of an object (eg specimen, work of art, photograph, analogue sound file, videotape), wrapping that version in metadata and making it available for sharing. 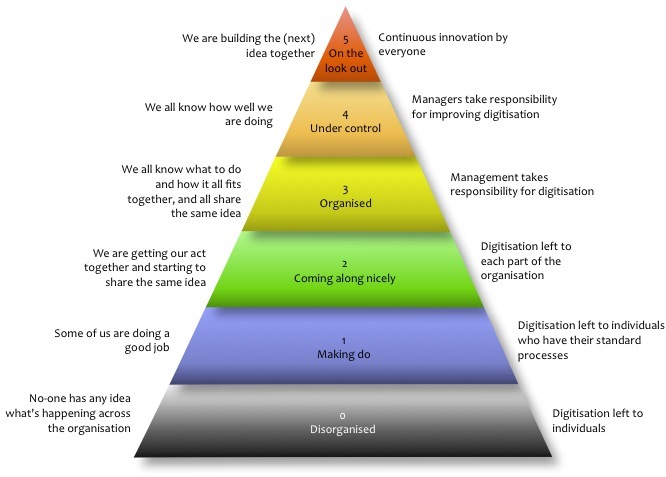 To help you improve your digitisation activities you can use the digitisation maturity model. This model allows you to rate your ‘digitisation maturity’ on a scale of zero to five and explains the actions you need to take to improve that maturity against each of the core digitisation activities. Details of the model are given in Digitisation: A strategic approach for natural history collections [.pdf 9.3 MB]. This document is also available as an ebook from the Apple iBookstore. Most Atlas partners have effective mechanisms to database their collections, but creating a digital image of a specimen or field note book or ledger has been a challenge because of limited resources or equipment. the issues confronting institutions in their imaging activities the differences between institutions technical issues in imaging biodiversity collections the approaches that can be taken to implementing imaging technology. the approaches that can be taken to implementing imaging technology. Download Introduction to Resolution [.pdf 3.7MB] for an short introduction to digital resolution (courtesy of Dr Les Walkling). AM volunteers imaged insects and their labels. Images are loaded into the Atlas’s volunteer portal from where crowd-sourced individuals transcribe the labels. Transcriptions will be loaded into the AM’s collection management system. SAMA uses volunteers to image and database type specimens. Database records will be loaded into the SAMA collection management system and the images shared with the Atlas. As indicated in the final reports of the project, both exercises demonstrated the value of using volunteers to image and database specimens. Documents produced by the Australian Museum are available on their website and those from the South Australian museum on their site. All provide a basis for other institutions establishing a volunteer-based digitisation program.